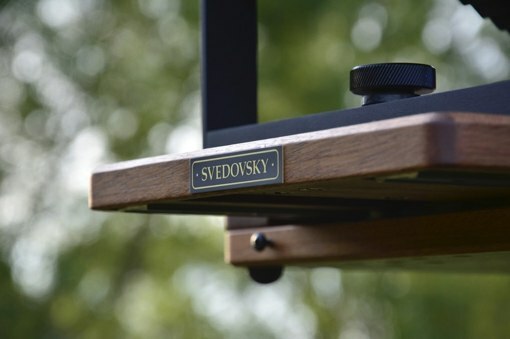 Svedovsky Cameras is my latest large format camera concept. I have been a photographer for a good part of my life, professionally working for many years in artistic carpentry. Finally, both occupations have found a conclusive common point in form of creating a series of wooden view cameras. Every camera maker starts with observing a deficit. What I missed about many view cameras available on the market was stability of used materials. For this reason I have decided to create a real working horse, a camera durable enough to stand years of usage under changing conditions and in difficult photographic situations. Svedovsky Cameras are designed using only the best materials. My experience in carpentry allows me to make the right decisions already while carefully selecting the wood to be used. Naturally, I work exclusively with professional tools and carpentry machines. All this guarantees a final product of excellent precision, beautiful design and lasting usage experience.